My daughter has been with Home Away From Home since she was just one year old. It was very hard for me to leave her with someone else. But Nichol made the transition going smooth. My daughter loves her and gets excited when she knows she is going to see her her and Heather, Nichol's helper. This daycare is amazing! My son started attending Nichol's daycare at around 8 months and he is now 3 years old. I wouldn't dream of taking him anywhere else. He looks forward to the time he spends there and he learns so much. She not only give quality care but she teaches him things to get ready for preschool as well! Great facility! Great provider! I've been with Nicky for a few years now. My baby girl has some health conditions that sometimes required special attention and she has always been great with her needs. She goes above what a normal daycare center would. Very reasonable prices too. After interviewing several providers I decided to give Home Away from Home a try and I don't regret it. My son loves it there. The children are always learning while having fun, the completed activities are proof. There is a great balance between Nicky, Heather and Grandma Bunny. My son has been attending since Feb 2016 and his vocabulary has improved dramatically. Home Away From Home Daycare is a great place for my two children. My children thrive and grow under Nichol's caring supervision. They loved her. She cares for them like their own. Because of Nichol's attentive and caring service, I did not have to worry about them when I am at work at Ft. Riley, KS. She provides wonderful care. 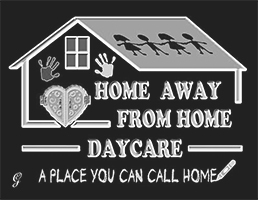 I recommend to anyone that needs excellent, affordable childcare service that they should consider Home Away Home Daycare as their first choice.